389 pages | 33 B/W Illus. There are few skills more important to the modern fact finder than the ability to obtain information through effective interviewing. While most interviewing books are intended for law enforcement, they often present harsh and accusatory techniques that can be counterproductive in private sector investigations. 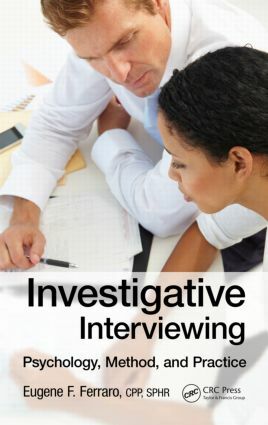 Investigative Interviewing: Psychology, Method and Practice covers modern techniques for private sector investigative interviews. It outlines a highly structured and process-driven technique that takes a non-accusatory approach, uses no intimidation or coercion, and has been proven to achieve admission rates above 90 percent. This time-tested methodology is easy to learn and replicate and will help you to significantly diminish the likelihood of false confessions. Sharing insights garnered over the author’s 30 years of experience in investigations and interviewing, the book includes case studies based on actual investigations that illustrate industry best practices. Although the text focuses on private sector investigations, the methods presented are also applicable in law enforcement settings. This book presents the tools and methods required to produce investigative results that are legal and admissible in court. It will help you develop the skills to ensure ethical interviewing practice while investigating a range of situations and protecting against those who intend to cause the organization harm.